Where to build the main bus? Title says it all. I pray for fast tips. 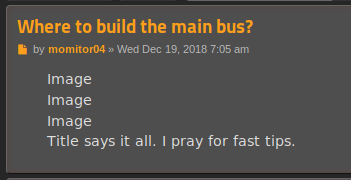 Re: Where to build the main bus? is this your only lake? Before praying, you should at least think how to make your prayer understandable. Don't try to pray too fast, and even more, don't ever try to pray, you woldn't ever have an answer. Ever. You need to explore more. The bus needs a lot of space and you probably don't want to have turn it around or fill up an ocean. But the currently explored area would suggest growing the main bus to the east with factories to the north and smelter columns and their bus south of the main bus growing to the east too. I suggest a restart of the save because the iron ore patch is to small. But he got really lucky to find some oil that early. So maybe he could continue the map if he rushes military and manages to conquer more iron before fully depleting his tiny starter field. Thank you all for answering, I decided to put the main bus over the lake growing to east. My smelter columns are located to the right from the iron patch.